A fire-damaged Morgan Lloyd Vaults, Thursday 3rd. June 2004. © K. Morris. 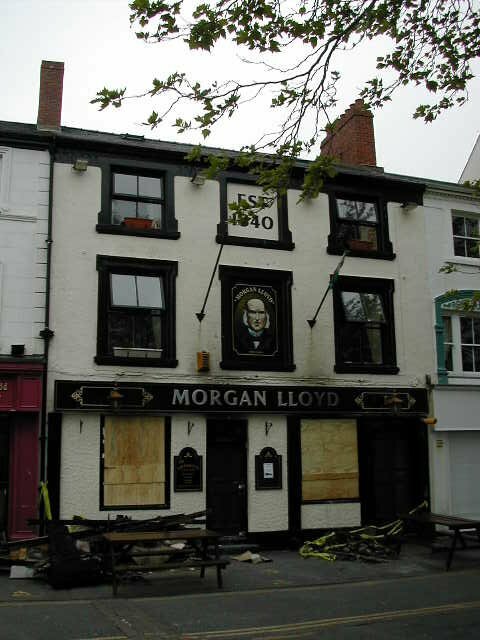 Sad to report that the Morgan Lloyd Vaults on Castle Square suffered severe fire damage early on Wednesday morning (2nd. June 2004). An electrical short-circuit is said to have caused the blaze, which was discovered at around 12:30 a.m. by night-shift workers at a nearby shop. The fire service had to break in to fight the blaze, which took over three and a half hours to bring under control, and two people were taken to hospital suffering from smoke inhalation. It is too early yet to know for definite what is happening, but hopefully the tavern will reopen in the not too distant future. Firstly, and most blatant, is the "EST 1840". This is incorrect as the business was started by Morgan Lloyd in 1845/46. In the 1841 census, Morgan is living and working on the premises of Ann Hughes, a chemist and soda water manufacturer, at Castle Square. (It is difficult to be sure, but they were probably these very same premises). He was then an Apprentice Chemist. He is not listed as a Wine Merchant until 1846, when he appears in J. Williams's Directory. Secondly, under Morgan's portrait are the dates (1800-1900). Now I do not know where these dates came from, but they are plainly incorrect. Morgan Lloyd did not live to be 100 years old. He was born at Llanrwst, Denbighshire, in about 1816, and died in 1894. 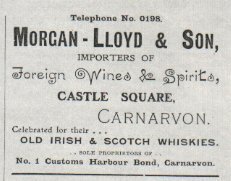 I have included an old Morgan Lloyd advertisement on this page, which should serve to whet the appetite for, hopefully, a fuller history of the company planned to appear in due course. More advertisements and other items associated with the firm would be welcome to illustrate the article. Especially wanted are examples of a water jug, advertising Glenlivet Whisky. There are two different versions, one with a green top half, and another in brown.